An import from Nantucket, Sfoglia is one of the few Upper East Side joints that, if transported to downtown, wouldn’t feel out of place. The front room feels like you’ve walked into an Italian market with shelves of food and baskets of produce greeting you in the entryway. Mismatched vintage tables, stone walls, and an array of vintage furniture bring a homey vibe to the front room. The back room is bigger and brighter, but still sports that same charm that makes you feel at ease the moment you enter. You can just sense that you are in for some good Italian cooking. A word to the wise, lean heavily on the pasta when ordering. That’s what separates Sfoglia from the pack. Giant, flavorful mussels tossed in a broth of tomato, garlic, salami, and fennel. The salami makes the broth nice and spicy, ideal for bread dunking (and the bread they serve is unbelievable). Sfoglia’s seasonal menu changes every two months, but the pappardelle alla bolognese is one of the few fixtures. This is their signature dish, and a damn good one. The pasta is cooked perfectly al dente, and the meat sauce manages to be creamy but maintain the ground meat texture. A must-order. The sweetness of the figs mixes with the saltiness of the light sauce, and somehow the hazelnuts pull it all together. This pasta dish is insanely addicting - they knock this one out of the park. For $32, this was just not worth the order. The orata (which is sea bream, a Mediterranean white fish similar to branzino) was a bit too fishy. You could smell it from down the table. Taken as a forkful with potatoes, tomatoes, and capers, it wasn’t terrible, but this isn’t something we’d order again. A nice, large portion of lobster-flavored risotto that was well-executed, but nothing exceptional. We were a little disappointed with the short rib, especially after the waiter said it was fantastic. The presentation was pretty minimal - it arrived in a small bowl with some pickled veggies, and it was slightly overcooked. Again, Sfoglia changes up their dessert menu seasonally. All cooked desserts must be ordered in advance, when ordering your meal. Do it! They don’t disappoint. 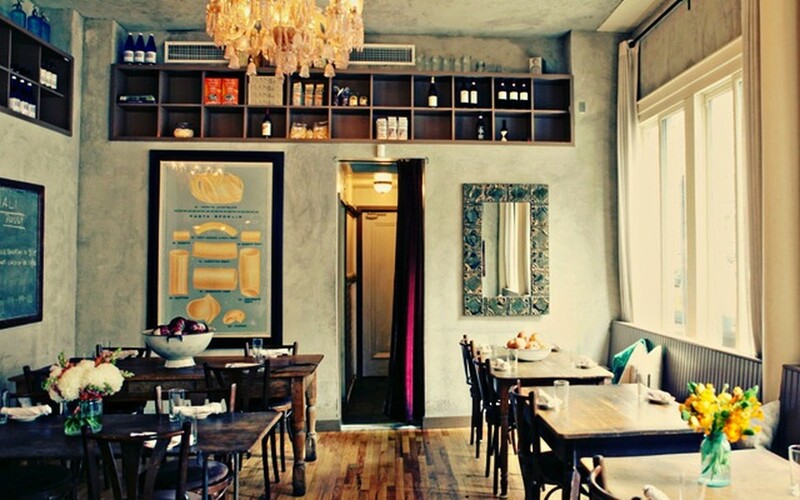 Some of the best pasta around is found at this old school-feeling spot on the Upper East Side.